If you know me then you know I’m a fan of visiting cemeteries. Call me sick, crazy or morbid I don’t care I just like going to pay my respect to people. One of my favorite singers of all time is the one and only Teddy Pendergrass. He had it all..the looks, the voice, the charisma…he was the man. 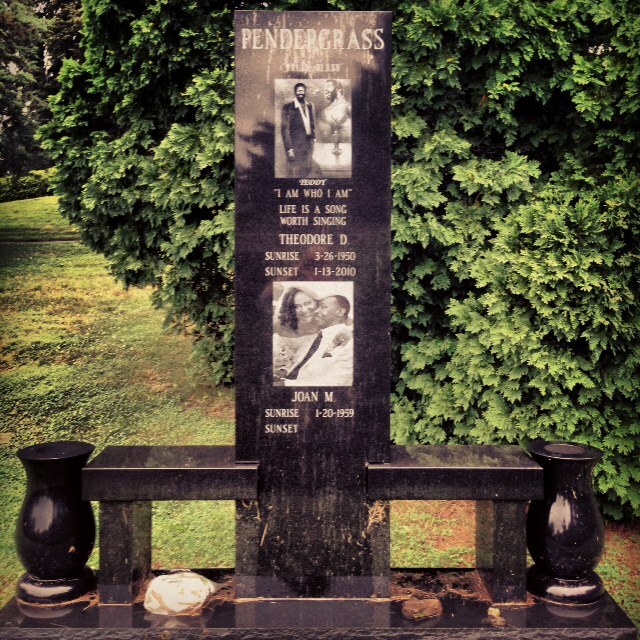 After watching the show “Unsung” about Teddy Pendergrass I was inspired to go visit his gravesite. So on our way back from our vacation to Canada I decided to stop by a small town outside Philadelphia to visit. Theodore DeReese Pendergrass is buried at the West Laurel Hill Cemetery in Bala Cynwyd. The plot itself is beautiful. You could tell that people come by and visit it a lot. I was able to take a moment to visit and reflect on the man and his career. This was Goal #34 and it’s a special one to me.